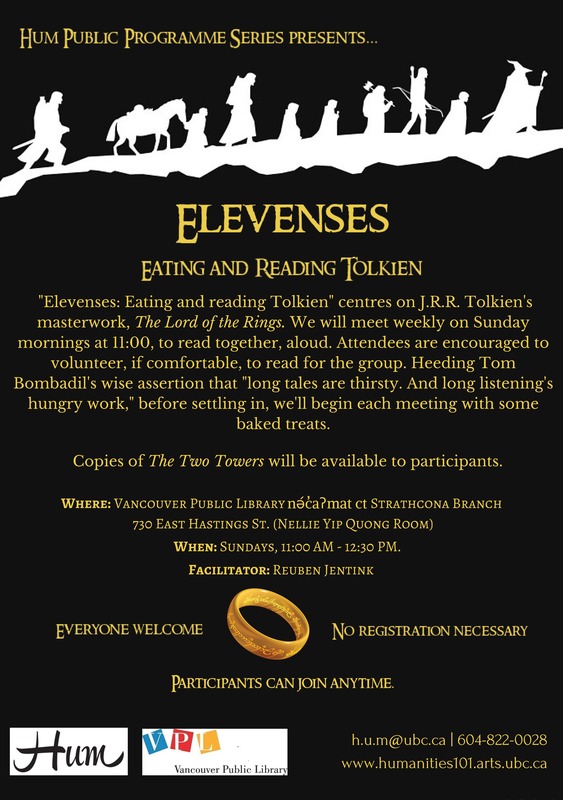 When: Sundays, 11:00 a.m. – 12:30 p.m.
“Elevenses: Eating and reading Tolkien,” centres on J.R.R. Tolkien’s masterwork, The Lord of the Rings. We will meet weekly on Sunday mornings at 11:00, to read together, aloud. Attendees are encouraged to volunteer, if comfortable, to read for the group. Heeding Tom Bombadil’s wise assertion that “long tales are thirsty. And long listening’s hungry work,” before settling in, we’ll begin each meeting with coffee, tea and cake. Copies of part two, The Two Towers, will be available for participants.